ArecaVSS requires Areca-Backup v7.2.13 or later and Windows Server 2003, 2008, Vista, 7 or later to operate properly. 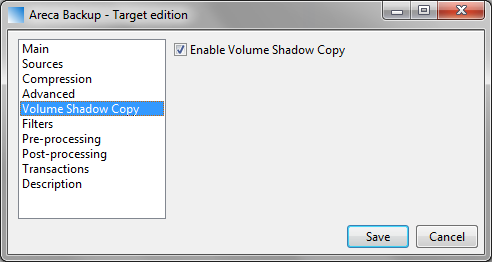 Due to specificities on the Volume Shadow Copy implementation for Windows XP, it won't operate on this system or earlier versions of Windows. 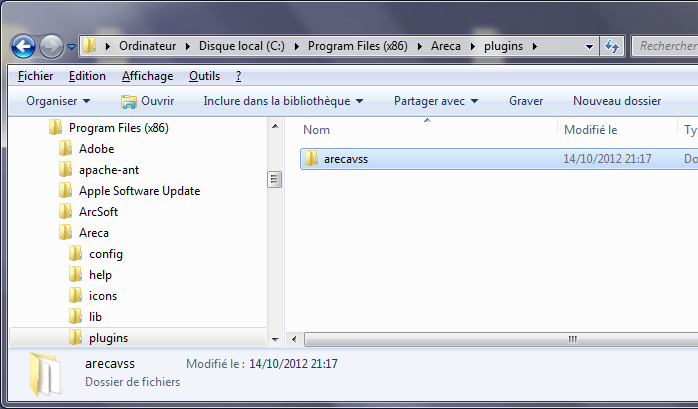 First, download ArecaVSS from here and unzip it in the "plugins" subdirectory of Areca-Backup. You should have a subdirectory named "arecavss". Once done, get a free license of ArecaVSS here and copy it in the ArecaVSS directory. This license will be limited in time (2 days) but will allow you to test ArecaVSS on your computer without purchasing a full license. Once you are totally sure that ArecaVSS works properly on your system, get a full license here and replace your free license by this new full license. Please use ArecaVSS' dedicated pages to submit bugs and feature requests. You can post general questions about ArecaVSS here. If needed, you can also contact us by sending an email to admin [at] arecavss [dot] com.